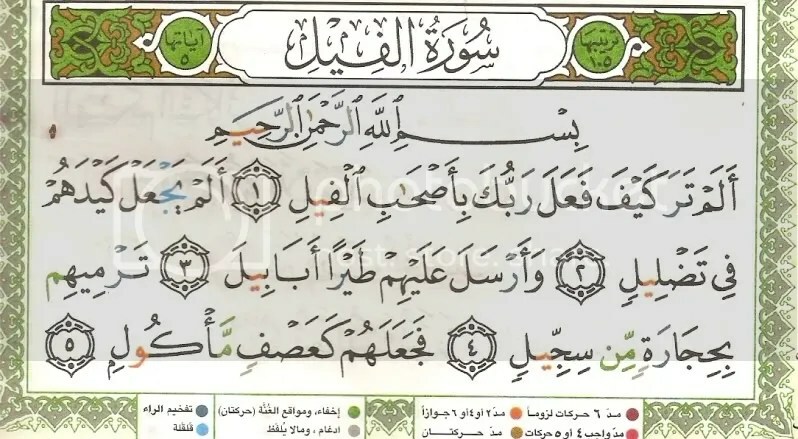 Allah begins this surah with a question to make the Quraysh ponder upon how Allah has saved the Kaabah from the enemy. This is a blessing to the Quraysh. Due to this bounty, the Quraysh’s status was elevated among the Arabs. Allah reminded them on how Allah ruined the enemy’s great plan. Allah is the best planner. Allah has willed for the army to march all the way from Yemen up to whwre they were nearing Makkah. In the way, Allah has willed the army to defeat a few groups who went out to stop the army. Which made Abrahah probably more confident of his unbeatable army. No one can stop him and his great army elephants. Allah has willed everything until finally to give the whole army the punishment thus showing the truth to the Arab world that the Kaabah will be protected by Allah. Imagine in the sky there comes a flock of birds coming to you. Like jet fighters carrying little bombs in their claws and beak. Subhanallah! Tiny little birds against the great elephant army? When Allah wills it, anything can be His soldiers. And in this story, the small birds were Allah’s soldier. Allah describes they are melt down and slowly vegetate looking like stalks of corn already being chewed up. Unrecognisable. The meaning of this is that Allah destroyed them, annihilated them and repelled them in their plan and their anger. They did not achieve any good. He made a mass destruction of them, and not one of them returned (to their land) to relate what happened except that he was wounded. This is just like what happened to their king, Abrahah. For indeed he was split open, exposing his heart when he reached his land of San`a’. He informed the people of what happened to them and then he died. The Quraish were idolators but the Elephant Army were Christians. Wasn’t Christianity closer to Islam than idolatry (shirk)? Why did Allah give victory to the Quraish instead? It is easy for Allah to defeat His enemies. People may plot against Allah & Islam but Allah knows of their plot. They cannot trick Allah. The torment for disbelievers is harsh indeed, even in this world. No matter how big the army of the disbelievers, they cannot defeat the armies of Allah.